Brain Depicted in the Sistine Chapel Ceiling? I’ve heard people joke that the Michelangelo’s Creation of Adam scene (Sistine Chapel ceiling, 1508-1512) looks like it displays a cut-away section of the human brain (with the oval-shaped cloth depicting the shape of the brain, and all of the heads and bodies suggesting brain matter). You can imagine how surprised I was to learn that scientists are currently arguing that there is a connection with Michelangelo’s Sistine Chapel and depictions of the brain, although not with the Creation of Adam scene. I think this is an interesting connection, but I do have some doubts. 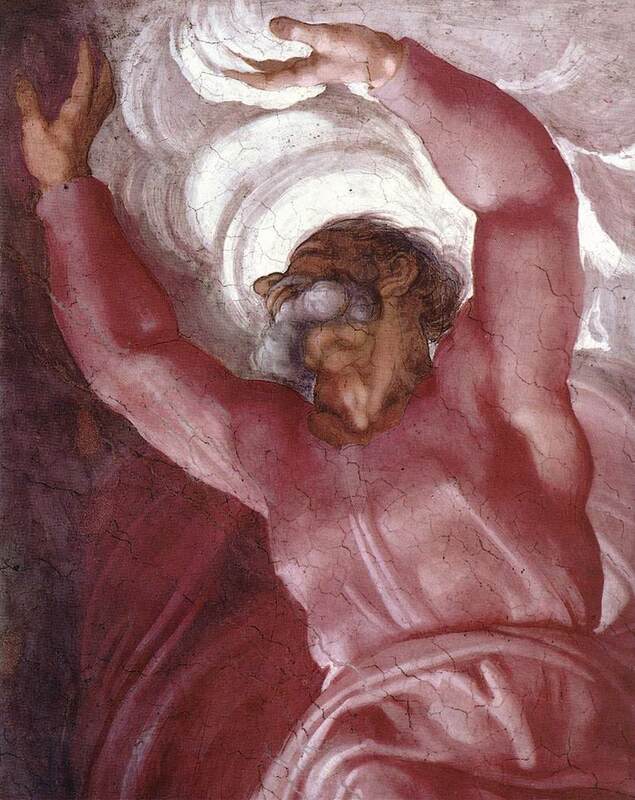 Michelangelo often made his figures extremely muscular and bulky (almost overly-idealized, in my opinion), and this detail of God the Father’s neck could just indicate the artist’s penchant for muscles and chiaroscuro/modeling. But, like I said, this brain theory is still interesting. I’m not familiar with enough scientific or anatomical imagery to make a definite conclusion on this new argument, but it’s fun to consider. Imhotep = Joseph of Egypt? About a decade ago, when I was sitting in one of my early art history courses, my professor offhandedly mentioned some speculations that Imhotep, the architect of the Stepped Pyramid at Djoser (ca. 2530-2611 BC, shown right), may have been the biblical figure Joseph of Egypt. I have been quite skeptical of this theory for years, largely because none of my art history textbooks allude to any connection between the two historical figures. For years I have meant to research this topic and see what speculations exist, and I decided that today was the day. After doing an initial search, I discovered that a lot of people speculate that Joseph and Imhotep are the same person. If you’re curious, you can see two less-scholarly sites here and here. I was surprised to see that someone thinks that the stepped pyramid was actually created to store grain (for the biblical famine associated with Joseph). Seriously? I find that incredibly unlikely. As I suspected, I couldn’t find any reputable scholars discussing such a topic. It also seems unlikely that Imhotep and Joseph are the same person, since the Djoser pyramid predates Joseph’s arrival into Egypt by about 1,000 years. (You can follow some of the theories regarding Joseph’s historical timeline here). I also learned a few new things about Imhotep during my research. He seemed like a very interesting and intelligent man. In addition to creating the stepped pyramid at Djoser (the shape of which is seen as the precursor to the sleek angles of the Pyramids at Giza), Imhotep was probably the architect for the step-pyramid complex Horus Sekhemkhet at Saqqara.1 By the Late Period (c. 750-332 BC, which is about two thousand years after Imhotep lived), the architect had achieved the status of a god. As a deified being, Imhotep was associated with medical learning and healing. There are many Late (and Greco-Roman) period statues of Imhotep seated and holding a papyrus scroll (you can see an example here). If anyone can provide some solid, scholarly evidence to support a connection between the Joseph and Imhotep, I’d be interested in reading it. For now, though, I’ve decided that the apparent lack of connection is for the best. It’s quite awkward to sing, “Go, go, go, Imhotep!” anyway. 1 Nabil Swelim, “Imhotep,” in Grove Art Online. 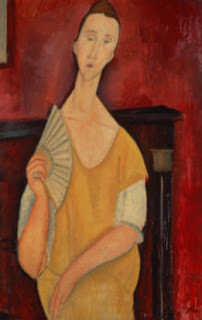 Oxford Art Online, http://www.oxfordartonline.com.erl.lib.byu.edu/subscriber/article/grove/art/T039994. Accessed 28 May 2010. Other artists have also decided to destroy or manipulate another work of art in order to make an artistic statement or protest. If you’re interested in seeing some examples, I would recommend that you read this fascinating post. The author mentions several examples of art destruction (including the story of Mark Bridger, who spilled black ink into one of Damien Hirst’s formaldehyde tanks). 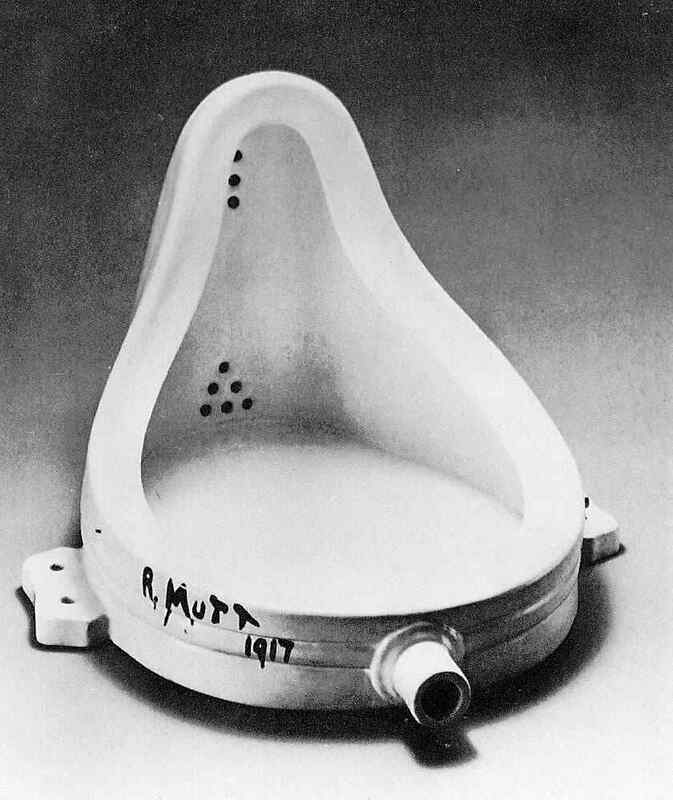 I learned from this post that a couple of artists have urinated on/in Duchamp’s Fountain at different times in the past two decades. Ha! I think that idea might have been clever the first time, but the repeated attempts seems a little silly. But, all that being said, I do have to admit one thing: such destruction can make me think about a work of art from a new perspective. And that’s one of the things that I like most about art. What do you think? Should art be ethical? 1 Don Thompson, The $12 Million Stuffed Shark: The Curious Economics of Contemporary Art (London: Palgrave Macmillan, 2008), 184. So, could we relate Prendergast’s map to the TV show? 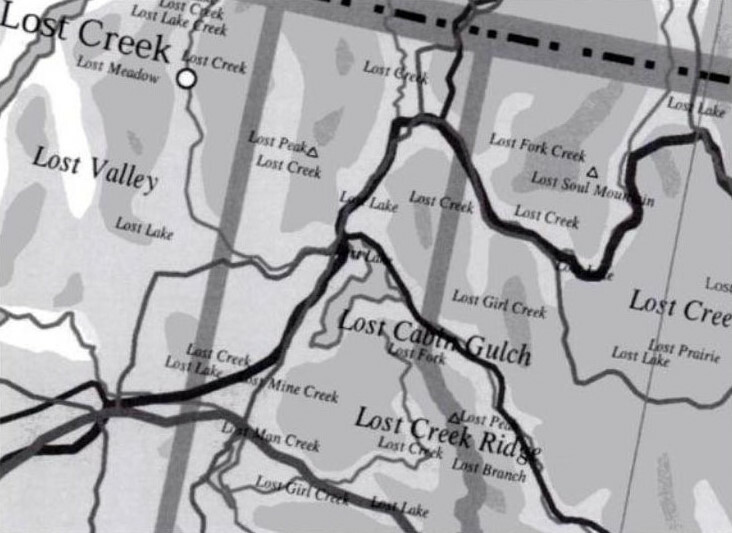 My only thought is that this map visually asserts why LOST has been such a popular show in the US – apparently we’re obsessed with the idea of being lost, since so many places are named accordingly. If you can think of other relationships between Prendergast and the TV show, feel free to post them in the comments section. I’ll crown the person with the wittiest answer (and accurate prediction for the finale) as the winner. 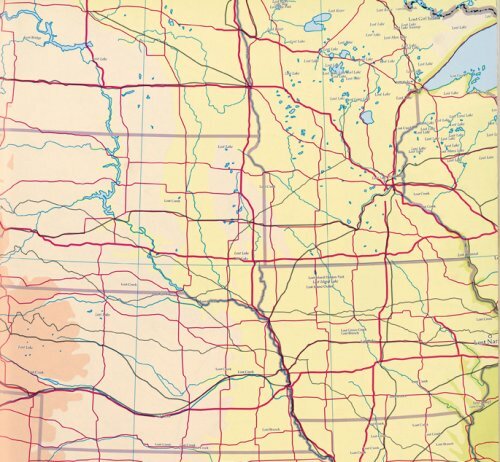 1 Mel Watkin, Terra Incognita: Contemporary Artists’ Maps and Other Visual Organizing Systems (Saint Louis: Contemporary Art Museum, 2001), n. p. An exhibition brochure. I hope that the museum ends up offering a reward for the recovery of the paintings. As discussed in a blog for The Economist, sometimes offering a reward is the most effective thing that a museum can do. Whenever art gets stolen, I always have the secret hope that someone in the art world hired thieves to steal the art, with the intent of later staging a recovery for the stolen goods. When art is stolen-and-recovered, it tends to bring higher prices at the art market. After all, wouldn’t you want to own a work of art that was famously stolen in a museum heist? And wouldn’t you like the reassurance that a painting was valuable, since someone took the time to steal it? The history behind any work of art always affects its market price. In other art crime news, last week the Feds arrested three people involved with an art heist conspiracy in the Seattle area. A disgraced gallery owner (who had served three years in prison for art theft) had conspired with a cellmate to steal works by Picasso, Renoir, and other Northwest artists. You can read the full story here.